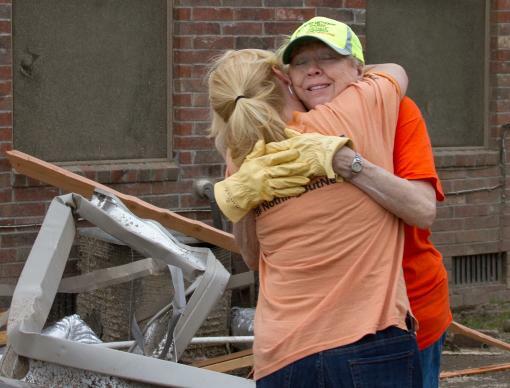 Ida Rose (right) receives a hug from Sheri Mathews, Spiritual and Emotional Care Team supervisor for the Arkansas Conference Disaster Response Team. Rose is an early response team member, but on April 28 she was at the severely damaged home of her son and his family, who live in the River Plantation neighborhood in Maumelle, Ark. By the next day, at least 16 deaths in Arkansas alone had been blamed on a fierce tornado that cut through 80 miles of suburban Little Rock, Ark., with the towns of Vilonia and Mayflower particularly hard hit. Rescue workers were still searching for survivors in Vilonia, where many homes and buildings were destroyed, including a $14 million public school set to open this fall. Vilonia United Methodist Church, northeast of Little Rock, suffered massive damage to its buildings, the officials of the denomination’s Arkansas Annual (regional) Conference reported. The nearby town of Mayflower also got clobbered, but Mayflower United Methodist Church largely escaped. Wilkins said some church members had their businesses destroyed, and others had their homes damaged. He’s aware of no fatalities or injuries among the congregation, but stressed that he doesn’t yet have a complete picture. Wilkins said his church would be ready to offer food, blankets and anything else to those displaced by the storms. “We just need to determine what the need is,” he added. Maumelle (Ark.) United Methodist Church is in another suburban community of Little Rock where tornadoes touched down. The church escaped damage, but at least three church members had damage to their homes, said the Rev. Zeke Allen, associate pastor. Bishop Gary Mueller of the Arkansas Conference offered encouragement. "Lives will be rebuilt," he said in a statement posted to the conference website. "Hope will return. And joy will be experienced again. All because the love of God has a way of bringing the best out of people in the worst of situations." The Oklahoma Conference reported storm-related shingle damage to Quapaw United Methodist Church, in northeast Oklahoma, near the borders of Kansas and Missouri. The town of Quapaw had two storm-related deaths and about a dozen homes were destroyed. The Rev. David Wilson, district superintendent for the Oklahoma Indian Missionary Conference, said Quapaw is home to 10 Native American tribes. Great Plains Conference officials reported slight damage to First United Methodist Church in Baxter Springs, Kan., another community hit by tornadoes and other storms Sunday. Sixty to 70 homes there were badly damaged, and at least three of those belong to members of First Church. The conference’s disaster response team plans to travel to the area Tuesday. The United Methodist Committee on Relief said it will be at work in the area, and donations can be made to U.S. Domestic Disaster Response, Advance #901670. Greg Forrester, UMCOR executive for U.S. disaster response, asked for continued prayers for survivors and the work of first-responders as well as for the safety of those in the path of new storms expected across the middle part of the United States. He asked that United Methodist volunteers not go yet to affected areas but instead wait for direction from conference United Methodist Volunteers in Mission.